Sparkes Hill is a prominent landmark to the East of Everton Park State High School, and bordered on the south-side by the Brook. In the past, it has been quarried, used as a dump but more recently hosts a group of large important water reservoirs in amongst its thick cover of tall trees. The Sparkes Hill BushCare Group was active in the reserve for many years undertaking cleanup activities, planting, weed control, nature study and path construction. The Group also worked in cooperation with teachers and students of the adjacent Everton Park State High School and Grovely TAFE. For over nineteen years, Bob Robbie was a legend as an energetic volunteer with habitat management on this water reserve. His leadership qualities were exemplary when interacting with other bushcare groups, community organisations, Brisbane City Council and government bodies. He was friendly and helpful simply as a contact person to give advice and information, especially anything to do with the flora and fauna on this reserve. In May 2011, Bob finally decided it was time to rest so he could enjoy the pleasures of life after Sparkes Hill. However, on the 15th December 2011, we lost one of our much loved community members and bushcarers, Bob Robbie. Bob passed away from cancer. He had the most delightful nature. His enthusiasm and passion for the conservation of Sparkes Hill, a 215 hectare bushland area, will never be forgotton. Sparkes Hill Reserve contains areas of open forest with a mixed eucalyptus canopy. 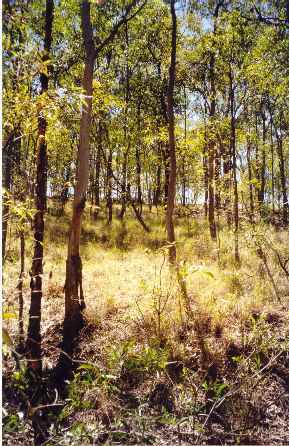 Native plants dominate the shrub layer and understorey; relatively large areas of kangaroo grass are present. In moister sections of the reserve, and near drainage gullies, weeds are more common. 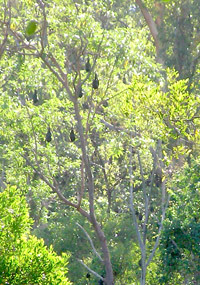 There is always a large colony of flying foxes on the western side that present a wonderful sight from the bottom Greenway path along the Brook.